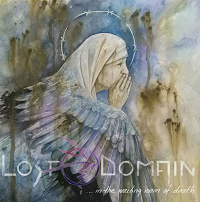 LOST DOMAIN is a Symphonic/Heavy Metal band based out of Stockholm, Sweden. This is their first full-length record entitled “…In the Waiting Room of Death”. It was released on May 18th, 2018 independently. It comprises 10 tracks and a total of 50:38 minutes of music. “Silent Cry” really brings me back to the early days of ELDRITCH with its powerful guitars and one thing that stands out are the pristine vocal talents of Catalina Leonte. She shows off a lot power but it never goes overboard. This is a great opening track and lays the groundwork for the heaviness that will follow in the next few tracks. “Beneath The Bridge” may start with a slower pace, but it has very nice power riffs and a darker EVERGREY meets LACUNA COIL feel to it. The production here is top-notch, as well. “Indicium” begins with Viking-like guitar melodies that you would expect from TYR and then goes into overdrive. This is a tremendously well-executed song with great tempo changes and intensity. One of my favorites by far on the album. Some other great ones include “Resistance is Futile”, which serves a great head banging riff throughout the song, “In Your Eyes” has a great mix of passion and heaviness that should appeal to fans of the bands I mentioned above. “Rebellious Angel” has a nice surprise with a collaboration from SOILWORK’s own Bjorn Strid, in some parts it actually does have a bit of a melodic Death Metal feel to it and the addition of the male vocals really fits the song perfectly in its chorus. Last but not least, the epic closer, “..In The Waiting Room of Death”, has a much colder approach than any other song on the album, its haunting, yet beautiful and goes through a myriad of musical changes. Needless to say, I was impressed by the musicianship, the production, and the flow of this album. Everything just works so well together. If you are into some of the bands I mentioned in this review, you should definitely check these guys out!